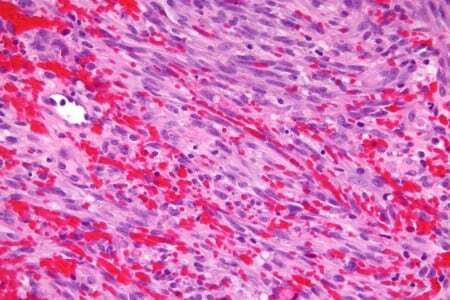 A handful of different treatment options are available for patients with Kaposi sarcoma. Treatment options are largely determined by the type of Kaposi sarcoma, the overall health of the patient, and whether the disease is being diagnosed for the first time or if it has come back after initial treatments. Kaposi sarcoma cells under a microscope. Creative commons image. Radiation therapy targets cancer cells with high-energy doses of radiation to kill the cells or prevent them from reproducing. Photon radiation therapy, which uses rays of high-energy light. Radiation electron beam radiation, which uses rays made up of tiny particles called electrons. Local excision, in which cancerous lesions are cut from the skin along with a small border of normal tissue. Electrodesiccation and curettage, in which lesions are cut from the skin with a sharp, hook-shaped device called a curette, after which an electrode used to apply electricity to the area to stop the patient bleeding and kill remaining cancer cells in the surrounding skin. Cryosurgery, in which lesions are frozen and then destroyed. Chemotherapy is a cancer treatment that uses drug therapy to target cancer cells in the body. The drugs are designed to kill or damage cells with characteristics similar to cancer cells, while causing as little damage to normal cells as possible. Chemotherapy may be applied to the entire body or to specific regions. Chemotherapy is given differently to patients with Kaposi sarcoma depending on where the cancerous lesions are located. For local lesions in the mouth, chemotherapy drugs may be injected directly into the lesion. For local lesions on the skin, a topical agent may be applied to the skin as a gel. Liposomal chemotherapy uses very tiny fat particles, called liposomes, to hold and administer anticancer drugs in the body. Liposomal doxorubicin is used to treat Kaposi sarcoma. The fat particles attached to the lesions in larger numbers that in normal tissue, and slowly release their drug load. In some cases, the patients immune system may be stimulated to attack cancer cells. Drugs or other substances—some made by the body, some developed in labs—are used to bolster, guide, or reinforce the body’s natural tools to fight disease. Substances made by the body or made in a laboratory are used to boost, direct, or restore the body’s natural defenses against cancer. 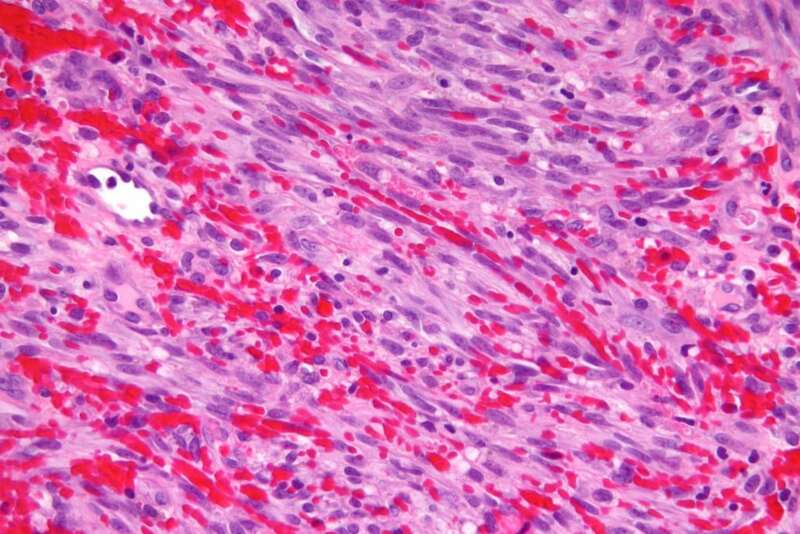 In the case of patients with Kaposi sarcoma, a biologic agent called Interferon alfa is used. New drugs are being developed that target and attack specific types of cancer cells without interacting with normal cells. Two types of targeted treatment are currently under investigation for use in patients with Kaposi sarcoma: monoclonal antibody therapy and tyrosine kinase inhibitors (TKIs). “Monoclonal antibody therapy is a cancer treatment that uses antibodies made in the laboratory from a single type of immune system cell. These antibodies can identify substances on cancer cells or normal substances that may help cancer cells grow. The antibodies attach to the substances and kill the cancer cells, block their growth, or keep them from spreading. Monoclonal antibodies are given by infusion. These may be used alone or to carry drugs, toxins, or radioactive material directly to cancer cells. Clinical trials are the main process through which new cancer drugs are developed. As part of the cancer research process, these trials are completed to test the safety and effectiveness of new drugs to determine if they are better than existing treatment options. In some cases, a clinical trial may be the best treatment choice. The standard treatments of today were, in many cases, refined and proven through evidence from clinical trials. Patients who decide to participate in clinical trials may be among the first to undergo a new treatment that may be more effective, and my still be eligible to receive standard treatment. SERO Physicians Support ALL-IN TO FIGHT CANCER What is Kaposi Sarcoma?